Lughnasadh or Lughnasa (pronounced LOO-nə-sə; Irish: Lúnasa; Scottish Gaelic: Lùnastal; Manx: Luanistyn) is a Gaelic festival marking the beginning of the harvest season that was historically observed throughout Ireland, Scotland, and the Isle of Man. Traditionally it was held on July 31 – August 1, or approximately halfway between the summer solstice and autumn equinox. Lughnasadh is one of the four Celtic seasonal festivals; along with Samhain, Imbolc, and Beltane. It corresponds to other European harvest festivals, such as the English Lammas. 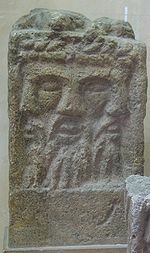 The festival is named after the god Lugh, and involved great gatherings that included religious ceremonies, ritual athletic contests (most notably the Tailteann Games), feasting, matchmaking, and trading. There were also visits to holy wells. Lughnasadh customs persisted widely until the twentieth century. The custom of climbing hills and mountains at Lughnasadh has survived in some areas, although it has been re-cast as a Christian pilgrimage. Since the latter twentieth century, Celtic neopagans have observed Lughnasadh, or something based on it, as a religious holiday. In some places, elements of the festival have been revived as a cultural event. In Old Irish (or Old Gaelic), the name of this festival was Lugnasad. This is a combination of Lug (the god Lugh) and násad (an assembly). Later spellings include Luġnasaḋ, Lughnasadh, and Lughnasa. In Modern Irish (Gaeilge), the spelling is Lúnasa, which is also the name for the month of August. In Modern Scottish Gaelic (Gàidhlig), the festival and the month are both called Lùnastal. In Manx (Gaelg), the festival and the month are both called Luanistyn. In Welsh (Cymraeg), the day is known as Calan Awst, originally a Latin term, the Calends of August in English. Lughnasadh was one of the four main festivals of the medieval Celtic calendar: Imbolc at the beginning of February, Beltane on the first of May, Lughnasadh in August, and Samhain in October. Lughnasadh marked the beginning of the harvest season, the ripening of first fruits, and was traditionally a time of community gatherings, market festivals, horse races, and reunions with distant family and friends. In Irish mythology, the Lughnasadh festival is said to have been begun by the god Lugh (modern spelling: Lú) as a funeral feast and athletic competition in commemoration of his mother (or foster-mother) Tailtiu, who was said to have died of exhaustion after clearing the plains of Ireland for agriculture. The funeral games in her honor were called the Óenach Tailten or Áenach Tailten (modern spelling: Aonach Tailteann) and were held at Tailtin in what is now County Meath. The Óenach Tailten was similar to the Ancient Olympic Games and included ritual athletic and sporting contests. The event also involved trading, the drawing-up of contracts, and matchmaking. At Tailtin, trial marriages were conducted, whereby young couples joined hands through a hole in a wooden door. The trial marriage lasted a year and a day, at which time the marriage could be made permanent or broken without consequences. A similar Lughnasadh festival, the Óenach Carmain, was held in what is now County Kildare. Carman is also believed to have been a goddess, perhaps one with a similar tale as Tailtiu. After the ninth century the Óenach Tailten was celebrated irregularly and gradually died out. It was revived for a period in the twentieth century as the Tailteann Games. In some English-speaking countries in the Northern Hemisphere, August 1st is Lammas Day (Anglo-Saxon hlaf-mas, "loaf-mass"), the festival of the wheat harvest, and is the first harvest festival of the year. In many parts of England, tenants were bound to present freshly harvested wheat to their landlords on or before the first day of August. On this day it was customary to bring to church a loaf made from the new crop. The loaf was blessed, and in Anglo-Saxon England it might be employed afterwards to work magic: a book of Anglo-Saxon charms directed that the lammas bread be broken into four pieces, which were to be placed at the four corners of the barn, to protect the garnered grain. In the Anglo-Saxon Chronicle, where it is referred to regularly, it is called "the feast of first fruits." The blessing of first fruits was performed annually in both the Eastern and Western Churches on the first or the sixth of August (the latter being the feast of the Transfiguration of Christ). For many serfs, the wheat must have run low in the days before Lammas, and the new harvest began a season of plenty, of hard work and company in the fields, reaping together. Thus there was a spirit of celebration at this time. In the medieval agricultural year, Lammas also marked the end of the hay harvest that had begun after Midsummer. At the end of hay-making a sheep would be loosed in the meadow among the mowers, for him to keep who could catch it. [A] solemn cutting of the first of the corn of which an offering would be made to the deity by bringing it up to a high place and burying it; a meal of the new food and of bilberries of which everyone must partake; a sacrifice of a sacred bull, a feast of its flesh, with some ceremony involving its hide, and its replacement by a young bull; a ritual dance-play perhaps telling of a struggle for a goddess and a ritual fight; an installation of a head on top of the hill and a triumphing over it by an actor impersonating Lugh; another play representing the confinement by Lugh of the monster blight or famine; a three-day celebration presided over by the brilliant young god or his human representative. Finally, a ceremony indicating that the interregnum was over, and the chief god in his right place again. 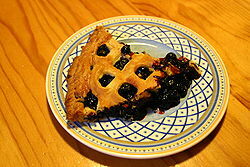 A tart made from fraughans (bilberries) gathered on the Saturday following Fraughan Sunday (last Sunday in July). This tradition is associated with the Lúnasa festival. As with the other Gaelic seasonal festivals, feasting was part of the celebrations. Bilberries were gathered on the hills and mountains and were eaten on the spot or saved to make pies and wine. In the Scottish Highlands, people made a special cake called the lunastain, also called luinean when given to a man and luineag when given to a woman. This may have originated as an offering to the gods. Another custom that Lughnasadh shared with Imbolc and Beltane was visiting holy wells. Visitors to holy wells would pray for health while walking sunwise around the well. They would then leave offerings; typically coins or clooties (strips of cloth or rags). Although bonfires were lit at some of the open-air gatherings in Ireland, they were rare and incidental to the celebrations. Among the Irish, Lughnasadh was a favored time for handfastings - trial marriages that would generally last a year and a day, with the option of ending the contract before the new year, or later formalizing it as a more permanent marriage. 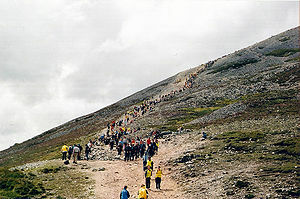 Pilgrims climbing Croagh Patrick on "Reek Sunday." It is believed that climbing hills and mountains was a big part of the festival since ancient times, and the "Reek Sunday" pilgrimage is likely a continuation of this. Many of Ireland's prominent mountains and hills were climbed at Lughnasadh into the modern era. Over time, this custom was Christianized and some of the treks were re-cast as Christian pilgrimages. The most popular is the Reek Sunday pilgrimage at Croagh Patrick in County Mayo, which attracts tens of thousands of pilgrims each year. 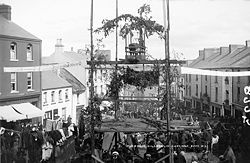 The Puck Fair is held each year in early August in the town of Killorglin, County Kerry. It has been traced as far back as the sixteenth century but is believed to be a survival of a Lughnasadh festival. At the beginning of the three-day festival, a wild goat is brought into the town and crowned "king," while a local girl is crowned "queen." The festival includes traditional music and dancing, a parade, arts and crafts workshops, a horse and cattle fair, and a market. In Ireland and mainland Europe many people continue to celebrate the holiday with bonfires and dancing. On August 1st, the national holiday of Switzerland, it is traditional to celebrate with bonfires. This practice may trace back to the Lughnasadh celebrations of the Helvetii, Celtic people of the Iron Age who lived in what is now Switzerland. In Northern Italy, such as in Canzo, Lughnasadh traditions are still incorporated into modern August 1st festivities. The Christian church has established the ritual of blessing the fields on this day. In recent years, various towns in Ireland have begun holding yearly Lughnasa Festivals and Lughnasa Fairs. Like the Puck Fair, these often include traditional music and dancing, arts and crafts workshops, traditional storytelling, and markets. Such festivals have been held in Gweedore, Brandon, and a number of other places. Craggaunowen, an open-air museum in County Clare, hosts a yearly Lughnasa Festival at which historical re-enactors demonstrate elements of daily life in Gaelic Ireland. It includes displays of replica clothing, artifacts, weapons and jewellery. A similar event has been held each year at Carrickfergus Castle in County Antrim. Lughnasadh and Lughnasadh-based festivals are held by some Neopagans, especially Celtic Neopagans. However, their Lughnasadh celebrations can be very different despite the shared name. Some try to emulate the historic festival as much as possible, while others base their celebrations on many sources, the Gaelic festival being only one of them. Neopagans usually celebrate Lughnasadh on July 31 – August 1 in the Northern Hemisphere and January 31 – February 1 in the Southern Hemisphere, beginning and ending at sunset. Some Neopagans celebrate at the astronomical midpoint between the summer solstice and autumn equinox (or the full moon nearest this point). In Wicca, Lughnasadh is one of the eight "sabbats" or solar festivals in the Wiccan Wheel of the Year, following Midsummer and preceding Mabon. Wiccans use the names "Lughnasadh" or "Lammas" for the first of their autumn harvest festivals, the other two being the Autumn equinox (or Mabon) and Samhain. Lughnasadh is seen as one of the two most auspicious times for handfasting, the other being at Beltane. Some Wiccans mark the holiday by baking a figure of the "corn god" in bread, and then symbolically sacrificing and eating it. In Celtic Reconstructionism Lá Lúnasa is seen as a time to give thanks to the spirits and deities for the beginning of the harvest season, and to propitiate them with offerings and prayers to not harm the still-ripening crops. The god Lugh is honored by many at this time, as he is a deity of storms and lightning, especially the storms of late summer. However, gentle rain on the day of the festival is seen as his presence and his bestowing of blessings. Many Celtic Reconstructionists also honor the goddess Tailitu on this day, and may seek to keep the Cailleachan ("Storm Hags") from damaging the crops, much in the way appeals are made to Lugh. Celtic Reconstructionists who follow Gaelic traditions tend to celebrate Lughnasadh at the time of "first fruits," or on the full moon nearest this time. In the Northeastern United States, this is often the time of the blueberry harvest, while in the Pacific Northwest the blackberries are often the festival fruit. ↑ 1.0 1.1 Patrick S. Dinneen, Irish English Dictionary (Nabu Press, 2010). ↑ Alexander MacBain, Etymological Dictionary of Scottish-Gaelic (New York, NY: Hippocrene Books, 1998, ISBN 978-0781806329). ↑ 3.0 3.1 3.2 James MacKillop, Dictionary of Celtic Mythology (Oxford University Press, 1998, ISBN 978-0192801203). ↑ 4.0 4.1 4.2 4.3 4.4 4.5 4.6 Patricia Monaghan, The Encyclopedia of Celtic Mythology and Folklore (Checkmark Books, 2008, ISBN 978-0816075560). ↑ 5.0 5.1 5.2 5.3 F. Marian McNeill, Silver Bough: Calendar of Scottish National Festivals, Vols. 1-4 (Glasgow: Stuart Titles Ltd, 1990, ISBN 978-0948474040). ↑ 6.0 6.1 6.2 6.3 Kevin Danaher, The Year in Ireland (Dublin: Mercier, 1972, ISBN 978-1856350938). ↑ 7.0 7.1 Nora Chadwick, The Celts (Penguin Books, 1971, ISBN 978-0140212112). ↑ John Thomas Koch, (ed. ), Celtic Culture : A Historical Encyclopedia (ABC-CLIO, 2005, ISBN 978-1851094400). ↑ 9.0 9.1 9.2 George C. Homans, English Villagers of the Thirteenth Century (WW Norton & Co., 1975, ISBN 978-0393007657). ↑ Máire MacNeill, The Festival of Lughnasa (Oxford University Press, 2008, ISBN 978-0906426104). ↑ Ronald Hutton, The Stations of the Sun (Oxford University Press, 2001, ISBN 978-0192854483). ↑ Loinneog Lúnasa. Retrieved January 23, 2014. ↑ Festival of Lughnasa – Cloghane & Brandon. Retrieved January 23, 2014. ↑ Lughnasa Festival at Craggaunowen. Shannon Heritage. Retrieved January 23, 2014. ↑ "Lughnasa Fair returns to Carrickfergus Castle". Carrickfergus Advertiser, 25 July 2013. Retrieved January 23, 2014. ↑ Eugene V. Gallagher and W. Michael Ashcraft (eds. ), Introduction to New and Alternative Religions in America (Westport, CT: Greenwood Press, 2006, ISBN 978-0275987121). ↑ Margot Adler, Drawing Down the Moon: Witches, Druids, Goddess-Worshippers, and Other Pagans in America Today (Boston, MA: Beacon Press, 1981, ISBN 978-0807032374). ↑ 18.0 18.1 Starhawk, The Spiral Dance: A Rebirth of the Ancient Religion of the Great Goddess (San Francisco, CA: Harper, 1989, ISBN 978-0062508140). ↑ Murphy Pizza and James R. Lewis (eds. ), Handbook of Contemporary Paganism (Brill Academic Publishing, 2009, ISBN 978-9004163737). ↑ Seasons Archaeoastronomy.com. Retrieved January 22, 2014. ↑ Janet Farrar and Stewart Farrar, Eight Sabbats for Witches (Phoenix Publishing, 1988, ISBN 978-0919345263). ↑ Isaac Bonewits, Bonewits's Essential Guide to Druidism (Citadel Press, 2006, ISBN 978-0806527109). Melia, Daniel F. "The Grande Troménie at Locronan: A Major Breton Lughnasa Celebration" The Journal of American Folklore 91(359) (January 1978): 528-542. This page was last modified on 3 August 2018, at 16:58.